The other day a friend of mine asked me if I had heard of a “divorce party” where a newly divorced man or woman throws him or herself a party to celebrate the ending of his or her marriage. I had read an article some months back about how “divorce parties” were becoming a new trend amongst today’s divorcées. I recognize that some people find themselves in terrible marital situations and freeing themselves from that position may be liberating and worthy of a celebration. I acknowledge that never having been in that predicament myself I cannot speak authentically from a person in that position’s point of view. It is also important that I mention, that many marriages that end in divorce produce children and I believe they are the shining light in what can be a devastating event in one’s life. When I read the article, a strong emotion bubbled up inside me, and that was sadness. I didn’t feel sadness for the person who just got divorced, as they appeared to be overjoyed, no my sadness was for the sanctity of marriage. Am I the only person that feels this way? I’m not sure when our society decided to start treating marriage as a truck stop along the road to better things, but I really wish we’d stop. It is not that I wish people would stay in their lousy marriages, more so I wish people wouldn’t get married in the first place. I feel the system has things backward. The process of getting a divorce is lengthy and complicated but the ability to get married is a easy and quick one. In most states for example you must provide a valid reason in order to petition for divorce; but you don’t have to provide a reason to get married. If people had to wait a designated amount of time before they got married, how many people would make it to their wedding day? Would it weed out those making rash decisions based on a fleeting feeling? Would it give couples time to recognize their differences don’t mesh well? Or would it give a couple more time to get to know one another? Learn better communication skills? Who knows? Instead, our system requires two people that in many cases have become adversaries to battle for a prolonged period which results in one or both feeling inclined to throw him or herself a divorce celebration when it is finalized. Were there red flags before you got married? Did you conclude divorce is the best for everyone after months of trying? Do you regret divorcing your ex? What would you change now if you could? Would it be getting married in the first place? If you were together for decades and decided to divorce, did the vows you took on your wedding day and what they represented fade the more years you were married? I get the impression from our entertainment outlets that the concept of lifelong commitment is now considered an aspiration for which a couple strives, but is widely viewed as non-binding and increasingly viewed in a cavalier manner. Which begs the question: what’s the point? Why do people get married? Depending on your religious beliefs, that question could be answered biblically. My husband Bernard and I being of the Christian faith have a biblical view of marriage. We discussed openly before our nuptials our thoughts and beliefs on why we were getting married, but we also spoke about our opinion and views of divorce. Neither of us believes in divorce, and both felt that should we hit a rough patch that we would work on and fight for our marriage. 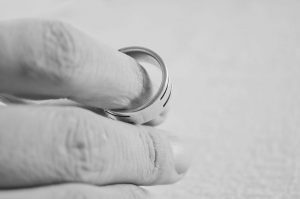 It may seem odd that we would even bring up the topic of divorce before getting married, but I feel that it is important to know and understand the thoughts, values, and beliefs of the person you’re marrying before you say, “I do.” Not speaking about a topic because you feel it is one of those things that “go without saying” or because it is uncomfortable seems always to end poorly. My post here is not to assert that I know best or that my beliefs are superior. This topic resonated with me, and I felt compelled to share my views. I would love to know what other’s think. I would challenge a couple who is still just dating before they even get engaged to have an open dialogue about why they want to get married and where they stand on divorce. Before popping the question, it is important because should you find yourselves with opposing views you are in an easier place to make rational decisions about whether moving forward is the best choice. Perhaps, your discovery could save you the trouble of a messy break-up post-engagement or even a messy divorce that would warrant a “divorce party” celebration. This entry was posted in Wives and tagged commitment, couples, divorce, engagement, love, Marriage, matrimony, weddings.